The new Cardiopulmonary Resuscitation (CPR) and emergency care guideline updates for 2015 have been released. The new guidelines emphasis the importance of bystander intervention and adjust some previously defined instructions for chest compressions and rescue breaths. Since 2010, studies have shown that most errors during CPR are a result of incorrect compression rate and depth. Both of these errors may reduce survival rates and the updated 2015 guidelines seek to adjust these inconsistencies while strongly encouraging bystander involvement. As before, the new guidelines emphasize chest compressions. Chest compressions are vital to keep blood flowing through the body and to the brain and are considered more important than rescue breaths since the blood already has oxygen in it. Chest compressions will continue to deliver oxygen to the right places and could save a life. Even someone who has never been trained in CPR at all should immediately start compressions on a victim after calling emergency response (9-1-1). The new guidelines also emphasize swift action from bystanders and even go so far as to recommend the use of social media to potentially alert nearby trained personnel to help with CPR. Taking action is essential in saving lives. A victims chance for survival decreases by 10% for every minute that Cardiopulmonary Resuscitation (CPR) and/or defibrillation does not occur. Quick reaction from bystanders along with proper training and coordinated efforts can greatly increase the chance for survival from cardiac arrest. It’s estimated that more than 325,000 people experience cardiac arrest each year, and about 90 percent of them die when it occurs out of a hospital. These updated guidelines hope to bridge that gap and save more lives through quicker acting bystanders and easier, more efficient CPR procedures. Communities are encouraged to incorporate social media technologies that can quickly summon rescuers who are close to a victim and are willing and able to perform CPR. Using social media outlets such as facebook, twitter, or even phone apps might alert a trained rescuer who is in close proximity of a victim. The social media technology might alert a rescuer who might not have known about the emergency situation otherwise. Change: In adult victims, it is now recommended for rescuers to perform chest compressions at a rate of 100/min to 120/min. The old (2015) guidelines called for rescuers to perform chest compressions at a rate of 100 compressions per minute. Change: In adults, during manual CPR, rescuers should perform chest compressions at a depth of at least 2 inches while avoiding chest compression depths greater than 2.4 inches. Rescuers should also avoid being too shallow with compressions. The old (2015) guidelines called for rescuers to perform chest compressions at a depth of at least 2 inches without specifying the maximum depth. The reason for this change is that there is that you might potentially harm the victim if you compress the chest too far. The updated guidelines take that into consideration. Trained responders should perform steps simultaneously to reduce time to the first chest compression. While the guidelines encourage use of hands-only CPR (CPR without rescue breaths) for untrained responders, they continue to recommend that trained lay responders conduct CPR with breaths. Remember to always call 9-1-1 first. Moving forward, authorities will no longer issue updates on a 5 year cycle. Updates will be issued as they are discovered so it’s important to stay informed and constantly renew and review your training. These CPR updates 2015 updated guidelines are set in place to help save lives. Being prepared and acting quickly is very important during an emergency. We recommend taking the FREE CPR Course offered by American BLS. 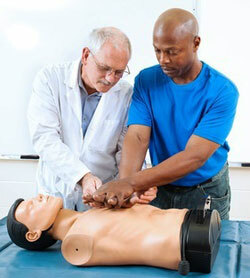 You will learn the proper way to perform CPR and can learn the skills necessary to save lives.